ANGELA Hits Her Mark On Milo Manara’s Variant Cover To GUARDIANS OF THE GALAXY #5! She’s one of the biggest new characters to debut in the Marvel Universe and today Marvel is proud to unveil your first look at Milo Manara’s jaw dropping variant cover to Guardians of The Galaxy #5, featuring ANGELA! Starting this July, Neil Gaiman teams with blockbuster writer Brian Michael Bendis and fan favorite artist Sara Pichelli to take the angelic bounty hunter to the outer limits of the Marvel Universe in an all new arc starting in Guardians Of The Galaxy #5! Alongside Star-Lord, Iron Man, Rocket Raccoon, Drax, Gamora & Groot – Angela must help the Guardians take down threats putting the galaxy at risk, showing why she’s one of the most feared women in the Marvel Universe! The arrival of Angela to the Marvel Universe marks one of the most important moments in comics history! With a major player like the fearless warrior making her presence known – no fan can miss how her debut impacts the Marvel Universe and beyond! 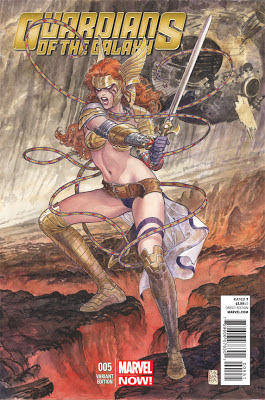 So what are you waiting for, reserve your copy of the Guardians Of the Galaxy #5 Angela Variant today! For more on Angela & Guardians Of The Galaxy, stay tuned to Marvel.com for more info! 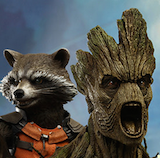 Join the conversation on Twitter using #GuardiansGalaxy , and don’t forget to follow us at @Marvel[www.twitter.com/Marvel]!